With millions and millions of apps available between the iTunes App Store, Google Play Store, Windows Market and AppWorld there is an app for everything. In fact, it was apple who coined the phrase “there’s an app for that”. Now apps are starting to incorporate with things in the real world and thanks to Beam Technologies, A Louisville Kentucky Startup, your toothbrush is one of those things. Ok possibly not really your toothbrush but there is now such thing as the Beam Toothbrush, Beam Technologies first product combining a real life physical item that we use everyday with an app. Just how appified is it? Will it turn on your electronic toothbrush? Will it remind you to brush your teeth? Will it let you know that you’ve been brushing long enough. Well at least some of those features are part of the Beam Toothbrush created by Alex Frommeyer, Dan Dykes and Alex Curry. What is a Beam Toothbrush? 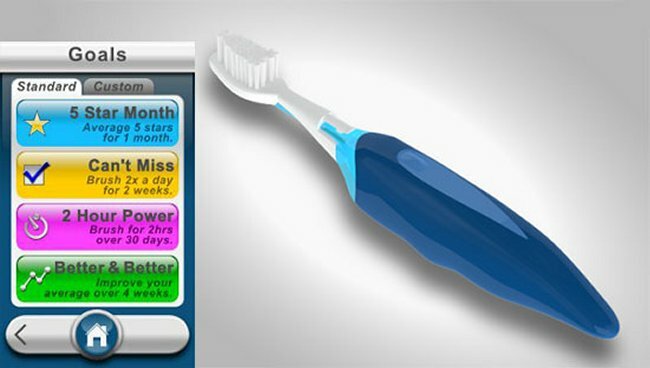 The Beam Brush is the first app connected toothbrush, a manual brush with sensors embedded to record and map brushing behavior. This data can be used in a personal management, clinical, and gamification environment. Alex Frommeyer, Dan Dykes, and Alex Curry are the 3 Founders of Beam Technologies. All 3 have masters of engineering degrees from the University of Louisville’s prestigious Speed School of Engineering. The team formed and launched INVEN LLC, a device development startup focusing in the dental space in 2010. Beam Technologies was a rebranded to the consumer oral care/digital health space in early 2012.
oResponsible for all business development, sales and marketing strategy, and fund raising. o Leads all product and technology development in mobile and electronics, industrial design. oResponsible for housing design, all intellectual property and regulatory management. Beam Technologies is based in Louisville, KY, home of the Kentucky Derby, Louisville Slugger, Bourbon, and Muhammad Ali! Louisville has a startup culture much more advanced than a city of its size should have. That said, the community is small, but it is very nimble and has provided with some amazing support and help to us. We are seeing an increased buy in from some of the previous entrepreneurial successes of the past in the city. Louisville needs to grow its investor class for tech startups, and work to produce a home run to galvanize its startup scene. How did you come up with the idea for Beam Toothbrush? Since our company was already working on other projects in the dental field, we started doing a deep dive into the future of the field. This was 2011, and momentum around mobile/digital health was just starting to make news. We saw this grand health/medicine movement beginning to emerge, and that was where we recognized an opportunity. Oral care is often a forgotten piece of this puzzle, so we thought we could use our background and interest in the dental field to become a leader of oral care digital health. The Beam Brush was crafted to help us address the most widespread and basic problem in oral care; compliance. If people simply paid a bit more attention to their mouths, dental disease could be managed much more effectively. The Beam Brush is using gamification, rewards, interaction, social media, and education to help streamline this process. Tell us about the app integration? The Beam Brush can collect up to 3 weeks worth of brushing data on the brush itself. It employs Bluetooth technology to upload it wirelessly to and Android or Iphone smartphone from there. The phone does NOT need to be in the bathroom with you while you brush, which is a commonly asked question. However, the app does have a timer screen with a two minute timer, animation for quadrant guidance, and allows you to play your favorite music while you brush. We use this feature every day! Technologically, our sensor. Our sensor uniquely fits in the upper neck/head portion of the brush, and it runs the show. Without it, there is no data, and that is central to the company. Our real secret sauce is our people. All of the Founders have amazing chemistry and oddly complementary skill sets which allow us to do intellectual property development, product development, and business development internally. We think this means we will be able to build more biosensors and other interesting digital health hardware/software products in the future. Funding is a classic and very present issue. Since we are not in any of the capital heavy environments for startups, taking risks has to be hedged against the capital you can afford to risk. This has both good and bad consequences. However, it can force conservation, and that is simply not the style or preference of most startups. There have definitely been times where we could have been more aggressive but had to pull in the reins because of funding. Hard to pick one when each day can be looked at as an overcome challenge! I would say our challenge was escaping the academic and more traditional environment that we started the company within, and creating a design and branding-centric, lean startup that closely modeled some of the companies we follow closely. What’s next for the Beam ToothBrush, any plans for app connected combs or hairbrushes? Haha not quite, but there is definitely a deep pocket of tricks up our sleeves. Our company hinges itself on its biosensor and hardware development capability, so you can definitely expect more in that arena. We think there is a great opportunity to establish ourselves as the true leader of oral care digital health. We believe there is strong value there, and niche we want to exploit fully.